Vladimir Putin arrived in Istanbul on Monday at the invitation of Turkish President Recep Tayyip Erdogan to participate in the 23rd World Energy Congress, which opened on October 9. During his speech at the conference, the Russian president said that he was glad that the Turkish authorities had managed to “keep the situation under control” and prevent a coup in July. Putin also wished the country luck in its continued recovery from the coup attempt. Putin said that he and President Erdogan had thoroughly discussed the joint Turkish Stream pipeline ahead of the visit, saying they “intend to implement” the project. He also assured Russia’s foreign customers that the country will remain a reliable energy supplier to global markets. The Russian leader expressed hope that an agreement on the stabilization of the oil market could be reached at the Organization of the Petroleum Exporting Countries (OPEC) meeting on November 30. “We support the recent OPEC initiative to fix production limits and hope that this idea will be embodied in specific agreements at the OPEC meeting in November, giving a positive signal to markets and investors," he said. The meeting of the two leaders will focus on restoring Russian-Turkish relations “in all aspects” and is going to provide the presidents with an opportunity to exchange views on a broad range of regional and international topics, first and foremost on the situation in Syria, Kremlin spokesman Dmitry Peskov told RIA Novosti on Sunday. Russia’s Foreign Ministry expressed hope that cooperation within the war-ravaged country will bear fruit and may even pave the way for joint action, pointing out that Ankara is ready to assist in the renewal of a ceasefire and to facilitate humanitarian aid deliveries. On Tuesday, Turkish Defense Minister Fikri Isık said that Turkey wishes that “Russia and the US would not oppose [each other]” referring to the recent escalation of tensions between the two powers after Washington suspended cooperation on Syria. While the US cited Russia’s non-compliance with the deal, Moscow accused US of shielding terrorists, in particular former Jabhat Al-Nusra fighters, by failing to separate them from moderate rebels. 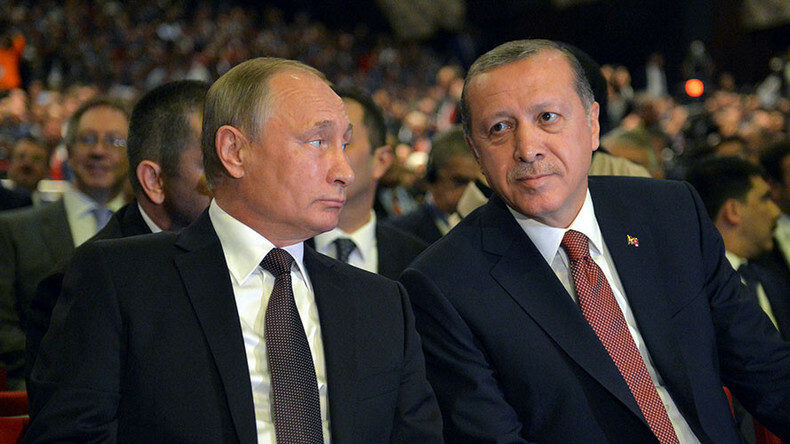 The expectations from the second Putin-Erdogan face-to-face meeting since August 9, which has already signaled a thaw in relations, are running high. In particular, there are hints that the recently resumed Turkish Stream project could be brought into force. The Turkish Stream gas pipeline would see Russian natural gas delivered directly to Turkey via the Russian Black Sea coast and on to Greece. The project, with an estimated total cost of 11.4 billion euros, was initially unveiled by Putin in December 2014 during a visit to Turkey as an alternative to the canceled South Stream route through Bulgaria. After the downing of a Russian jet in November 2015, Russia suspended the project. It was revived only after Turkey publicly apologized for the incident in August. — RT (@RT_com) 4 сентября 2016 г. The capacity of the pipeline would reach some 32 billion cubic meters per year, from which Turkey would take 15.75 billion cubic meters in the first leg of the pipeline, transiting the rest to Europe via the second leg. The construction of pipelines was expected to be finalized by 2019. The construction of the Akkuyu nuclear plant, with four 1,200 MW reactors, will be also given an extra impulse, according to Novak, who hopes that it “is going to get the status of a strategic investment.” Russia and Turkey signed an agreement for the facility to be built by Russia’s Rosatom back in May 2010. The first block of the $22 billion power station will be put into operation in 2020, the minister said. “Energy is one of the main issues in the normalization process. That’s why both the Turkish Stream and Akkuyu nuclear plant projects play a key role in the revitalization of bilateral relations,” Novak said in an interview to Turkish Daily Hürriyet, as cited by TASS. In response to the downing of its jet in November, Russia has imposed a string of harsh sanctions on Turkish goods, fruit and vegetables, as well as placed travel restrictions and reintroduced visas for Turkish citizens. The diplomatic downturn dealt a heavy blow to the Turkish economy with bilateral trade volume plummeting from $24 billion in 2015 to just $11.2 billion for the first eight months of 2016, Turkish Economy Minister Nihat Zeybekci told TASS. Now, the countries are seeking to restore the volume of Russian-Turkish trade turnover to its pre-crisis levels. To reach the goal of $100 billion trade volume reinstated by Erdogan at the August meeting, the countries are looking at mutual settlements in Turkish liras and Russian rubles. “I hope that the Central Banks are going to discuss it now,” Russian Economy Minister Alexey Ulyukayev said, confirming that dialog on the issue has been resumed. In January 2017, Russian and Turkey plan to sign a comprehensive services and investment agreement, the details of which are still being thrashed out. "We have settled all our differences. The document is practically ready for signing. We hope it will be signed in the presence of the two countries' presidents in January, during a session of the top-level cooperation council," Ulyukayev told Rossiya-24 television channel. By the end of 2017, the countries may also enter into a free trade agreement, according to Zeybekci. “In general, I want to say that we have actively set our hands to work and have been making up for what was lost in the last few months,” Ulyukayev said upon meeting with his Turkish counterpart.